Sorry for the lack of posts recently. Ike was out of commission for a few days as we puzzled through the lameness issues and I was too busy duct taping diapers to his hoof to think about writing. Then, I disappeared to the beach for a week for some fun in the sun. I believe things were still in limbo when I last updated you on Ike’s status. I was still thinking “Crap! My pony is broken.” I never saw any swelling or obvious neon signs noting the exact problem, and my highly scientific “poke and prod” method also turned up nothing. No abscess ever appeared. Had the vet out for my peace of mind, and fortunately, she found nothing amiss. Long story short, we changed Ike’s farrier and shoes and went back to work for 3 days before vacation. And I wish I could say that our Fix-A-Test was a smashing success for our first attempt at Second Level Test 2, but I cannot. Note to self: Do not schedule a clinic or show less than 24 hours after arriving home from vacation and after 8 days of not riding. And no, a 3 hour beach trail ride does not count as practice. My Second Level riding skills are still elementary at best, so when I don’t practice regularly, I digress quickly. It also doesn’t help that Ike likes to get spooky at new venues. “Rhythm change” AKA spooking into canter when you should be starting your medium trot will earn you a well deserved score of 4 for the movement. I also suppose I really should buckle down and school our turn on the haunches as well. Our total points for both turns were 9…I will let you do the division. Yeah, it will be hard to crack 60% with numbers like those. It also does not help that the rider blanked out in the middle of the test and started the countercanter half circle a letter before the test requires. Does laughter count as using your voice in the test? But, before you start thinking we should go back to First Level, we did manage some decent scores for a few movements. Our right lead countercanter earned some 7’s and there was even an 8 for our first canter transition. Now we just need to figure out how to get those 4’s to shape shift into 6’s, 7’s, and 8’s. While the test left much to be desired, we came away from the Fix-A-Test with some excellent tips from the judge. She was very tactful with her comments which I truly appreciate. She also had laser sharp vision and easily noted our weaknesses that need to be addressed now in order for all our future work to be successful. So we will get back to work with our pointers in hand. I will try to keep the laughable moments to a minimum. 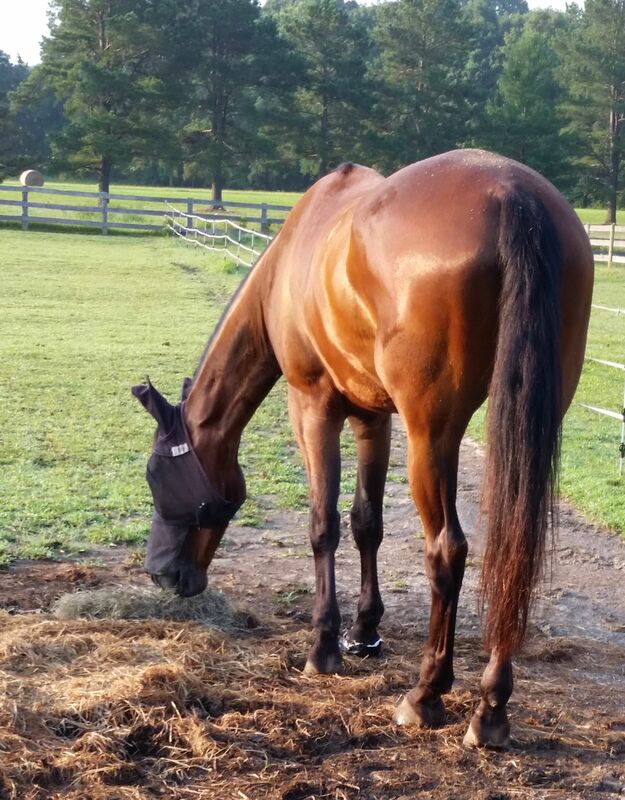 So all my equine loving friends probably already know what I am about to tell you based on the title of this post…for everyone else, we believe that Ike is getting ready to blow an abscess. Fingers are crossed that things resolve quickly and we will be back to work sooner rather than later. Why do we think that this is the cause? For my past 4 rides, Ike has been a bit of a pill. There was no head bobbing until yesterday, but he had been unsteady in his contact and blowing through my aids for down transitions. The theory is that his right front hoof has been sore and the disobedience was his way of letting me know that something wasn’t right. Since I thought he was just being difficult, I scheduled a lesson for yesterday afternoon so Ms. C could help me…well, as soon as I picked up the trot, we knew that something was very, very wrong. Head-bobbing lameness that was worse tracking to the right. I hopped off and we put Ike on the lunge line. Ugh! Not pretty. Thankfully, Mr. D was home and he was willing to test the hoof. Ike was reactive to the hoof testers but it was not horrible. We tried pulling a nail or two to see if there was a bad one, but in the end, the shoe came off and the soaking bucket came out. Big man was fairly cooperative for the hoof soaking. While the hoof was soaking, I fashioned is temporary bootie to protect the shoeless hoof. The sole of the bootie was multiple layers of duct tape and a diaper became the bootie. If diaper companies only knew what equestrians did with their diapers, they would totally reform their marketing strategies! It is at this point I wish I was an octopus in order to have enough hands to hold my horse, hold up the hoof, place the diaper and duct tape sole, and then wrap the entire bootie with more duct tape. I felt confident that it was secure and would last until morning…ha! About 6:30 p.m. last night I received a message from Ms. C that a certain horse decided to whoop it up in his paddock. He ran and bucked like a bronco. Hmm, I guess the combo of shoe removal and Bute administration made someone feel better. Sadly, the bootie was a casualty of the melee. Better the bootie than my horse’s hoof. Ike was in good spirits this morning. Soaking was easy since he was busy eating his breakfast. I constructed his new bootie and left him peacefully eating hay with the admonition that he was to behave until I returned after work to evaluate his status. Someone was happily grazing when I returned. Good News #1 – the bootie survived intact and was still in place on Ike’s hoof. Good News #2 – Ike looked almost 90% sound at the trot when we lunged him. The other 10% we blame on my makeshift shoe…I would run funny too if I was missing a shoe or had a diaper wrapped around my foot. So, that begs the question, “was it the start of an abscess or a wonky nail or two that was causing the problem?” Decided to still soak the hoof and fashion another bootie. If Ike looks sound in the morning, the shoe will go back on as soon as possible. If he is worse, then we will formulate a new plan. Thankfully we have no shows scheduled until August, so if we had to have some down time, this was as good as any. Fingers crossed that we are back to work by Thursday or Friday.